Jeunghun Wang fired a brilliant third-round 65 in difficult conditions in the Qatar Masters at Doha Golf Club, the Korean youngster moving three shots clear at the top of the leaderboard. Wang, a 33-1 chance ante-post, has gone odds-on across the board after taking control on a breezy Saturday when nobody else in the field could match his seven-under-par round. Wang has won twice on the European Tour – last year's Hassan Trophy and Mauritius Open – and the 21-year-old is staring at the biggest victory of his short career. The 2016 European Tour Rookie of the Year is bursting with confidence. Tour maidens Nacho Elvira and Jaco van Zyl are tied for second place, with South African raider Thomas Aiken alone in fourth spot. Ryder Cup duo Rafa Cabrera-Bello and Andy Sullivan are among those in fifth. 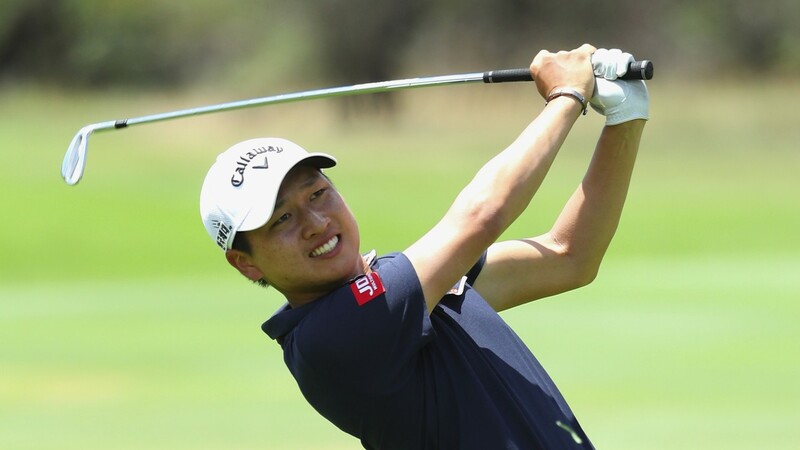 Jeunghun Wang seems a fearless character who can produce sensational golf when in the groove. His third-round 64 in the Nedbank Challenge in the middle of November was one of the best rounds of 2016. Wang followed up with a 75 in round four, finishing runner-up to Alex Noren in the Nedbank, something of which Qatar Masters punters should be aware. But that contrasting weekend is the only negative it is possible to throw at the leader. This looks a gilt-edged chance for Wang to become a three-time European Tour champion at the tender age of 21. Wang drives far enough to handle Doha, a 7,400-yard layout, and his sublime short-game skills make every hole a birdie opportunity. Wang has quickly established himself as one of the best on the European Tour on and around the greens, and his putting form over the closing stages of his maiden victory last year was truly gobsmacking. Wang showed when winning the Hassan Trophy that he possesses bundles of bottle, then he proved in his Mauritius success that he can handle a breeze. The forecast for a windy final day in Qatar will not worry him one jot. There are lots of weak finishers chasing Wang. Jaco van Zyl has forever been a European Tour bridesmaid and gets extremely twitchy in contention, while his fellow South African Thomas Aiken struggles to hole enough putts to convert winning chances. Aiken's tee-to-green stats are typically fantastic and the final-day forecast favours him, but an unconvincing putting stroke makes the 33-year-old difficult to trust. Rafa Cabrera-Bello has spent the last three years of his career creating final-day chances, without winning, and his fellow Spaniard Nacho Elvira is still awaiting a European Tour breakthrough. Elvira has been a prolific Challenge Tour champion, claiming four titles, but no joy has come in the higher grade. The closest Elvira came was in last year's Hassan, denied by Wang miracles, and the Korean is becoming something of a nemesis for him. The layers go 20-1 bar those mentioned, and rightly so. Wang has a five-shot advantage over those in fifth place and is almost certainly playing too well to let them pass. Lack of course experience was the big negative against Wang's name at the start of the week, but he has slowly but surely got to grips with the track, improving his score each day (69, 67, 65). The leader should be shorter in the betting than 17-20. Final-round twoball punters are pointed towards Aiken, who should handle the conditions better than Elvira in the penultimate match (8.56am UK and Ireland time). The final group – Wang and Van Zyl – are scheduled to board the first tee at 9.05am UK and Ireland time. 17-20 J Wang, 10 J van Zyl, 12 N Elvira, T Aiken, 16 R Cabrera-Bello, 20 K Aphibarnrat, 22 A Sullivan, 33 J Lagergren, 66 N Kimsey, 70 bar.